Details have emerged online concerning Ridley Scott's Prometheus and going by the recent rumblings, these new details seem pretty accurate. Bleeding Cool report via their unnamed source how Xenomorphs may appear in Prometheus. "Quite simply: it has the Alien aliens in it. The catch, though, is that you might not recognize them – at least, not at first. Remember how the alien took on canine qualities after gestating in a dog? You may even suppose that the first film’s alien was so recognizably humanoid because it had grown in a human. The same applies here: generation by generation, the creature mutates. 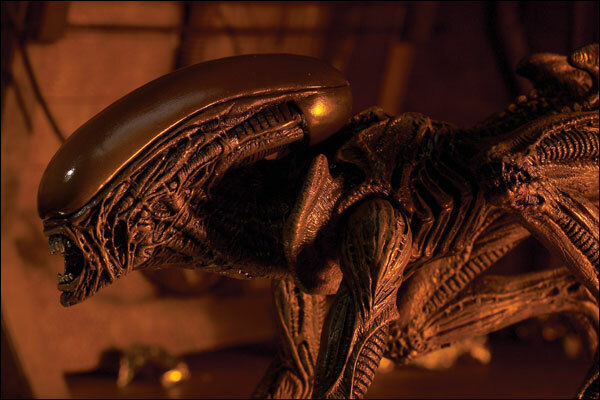 As Prometheus begins, the xenomorph is not too recognizable. Sure, it has that alien DNA that Scott and Fassbender teasingly referred to, but it’s missing… well, it’s missing human DNA. Or dog DNA. All you have to do is imagine how it might look if it were to mix DNA with another alien species… and I think we’re starting to work it all out." So we have tangents and ideas emerging from other Films in the franchise. Its interesting to de-construct the design of the Sentient Drone Xenomorph, from the original Alien , many redundant physical attributes which have never been explained such as the Dorsal Spines along its back suggest amphibious genetic adaption. So cut away all these attributes and what do we have, a nightmare incarnate. This concept of DNA splicing "recognizable strands of DNA" were the words Scott used. Is he referring to this pre-parasitoid Proto-Alien? Michael Fassbender inadvertently revealed that Aliens are involved in Prometheus and are actually quite tall, then Sky went steps further with more details stating: "familiar Giger-esque Aliens do appear." 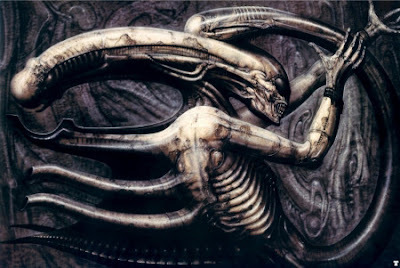 We know that H.R Giger is involved and supervising designs so even more so now than any other time does it feel that Prometheus just like its classical name suggests is the story of origin whether you name it a prequel or not. I'm reading: RIDLEY SCOTT'S [PROMETHEUS] SCRIPT DETAILS EMERGETweet this!